"Is there anything else I can do in Lake Sebu besides taking the zip line?" Like my friend who has an aversion to heights, many people, especially those who are not keen on adrenaline-pumping adventures would most likely ask this question. 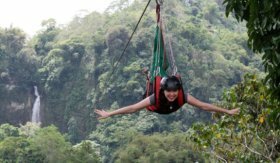 It's given: Lake Sebu is now synonymous with the Seven Falls Zip line. But South Cotabato's premiere destination for both foreign and local tourists offers a lot more. Travellers who want to spend time communing with nature or relaxing from hectic urban life and those who want adventure, have several choices to venture in. Each morning, the lake greets you with a mist that would have you think the very placid blue lake is actually evaporating as the sun rises. If you get tired of the Lake you have Dongon Falls to come to. Dongon Falls is now more popular by the name The Seven Falls. As the name suggests, Dongon Falls is a series of seven falls within a span of less than three kilometers. The first of the seven falls is the widest and the second is the tallest, dropping about 500 feet. "God was in his happiest moment when he created the flowers in Lake Sebu," a friend said. "It's as if God poured extra color and more cells into plants here." With you on the boat is a lady guide who will provide very significant information about the lake, the town and its people. She will also answer all your queries, of course about the lake. A piece of advice to those who are not used to eating this freshwater fish: Just take an initial bite. I assure you will be looking for more. After taking the zip line, your most likely destination is Falls Number 2 where visitors stay the longest. The place is very ideal for taking pictures and for picnics. The area, however, is in one of the lowest parts of the entire zip line park and everyone has to go back up to the first station where most vehicles are parked. More advice: The route is very ideal for those who have strong lungs and those who have a lot time to trifle away. Those who have companions waiting for them in a vehicle at the parking lot are advised not to take the stairs because this really takes so much time, not only because of the long climb up but also because you will definitely enjoy what you will see and hear along the way. The first line is 700 meters long and takes about a minute to complete; the second line is only 400 meters long but the angle is a little more steep which makes the travel faster. Safe? Yes, it is. Ask the staff who straps you into your safety gear and the zipline and they will tell you, the zipline is capable of carrying a load of 20,000 kilograms.